Eating a healthy, low calorie diet is the popular way to lose weight and gain better health and it can be very effective. But you can only go so far with dieting, as your body will eventually slow itself down to match the amount of nourishment and calories that are coming in through that diet. In short, your metabolism will gradually slow down to match its source of energy. To keep it high and working for your benefit, it is just as important to get some form of daily exercise included in your weight loss program. Many people don't like the idea of going to a gym to work out or playing sports is too much trouble for some. But there are plenty of other ways to get exercise. 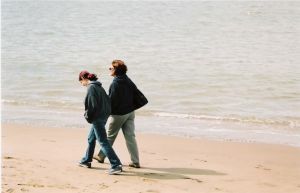 There is a lot of evidence to suggest that you can walk and lose weight as long as the walking that you are doing is more than just a lazy amble or stroll and more like a determined, faster paced actual walk. And it needs to be for a decent length of time and not just around the block. It works because when you walk in the fresh air at an elevated pace for around half an hour or more, you are making your leg muscles work harder than they would do just sitting in a chair and they, in turn must use energy to perform that work. After a while, usually 20 minutes or so, they will have used all of the energy that the blood can supply in the form of glucose, so the body will be forced to keep the supply coming. To do that it must manufacture more glucose, which it gets from the body's fat store. So you are using up some of that stored fat while also increasing the body's metabolism with the knock-on effect that the whole process raises the body's ability to burn more energy and use up more of the unwanted stored up fat and reduce its weight. You are also getting more exposure to natural daylight and some sunlight, which boosts production of serotonin (the feelgood hormone) to banish any feelings of depression while also boosting vitamin D production, which is linked with slow and steady weight loss. This all means that more, if not all of the calories that you consume through your diet get used up by that simple, yet effective exercise plus some more which reduces your body's store of fat. This equates to a drop in body weight and an increase in fitness levels. So now does it seem worth getting out into the fresh air to enjoy taking in the sights of your local neighborhood? You bet!